A small multiple that shows movement in time. The classic "The Horse in Motion" by Eadweard Muybridge. "Sallie Gardner," owned by Leland Stanford; running at a 1:40 gait over the Palo Alto track, 19th June 1878. This is great information - detailed technical data including a calibration standard in each frame. Many modern photos and series are not so well annotated. 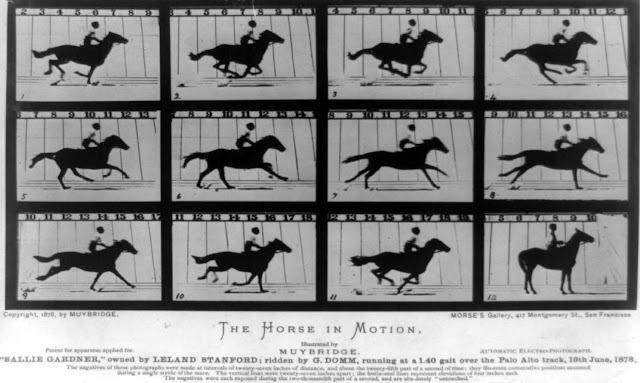 However, what is really intriguing is that if you search on Google for this image you will find a number of 'Horse in Motion' sequences by Muybridge with different horses which is understandable. More interesting are the images that also appear to refer to Sallie Gardner 19th June 1878 but are quite different to the one I attach here with slightly different text and modified calibration grid. For example the image you see on Wikipedia 'The Horse in Motion.jpg' and which I show in an earlier post - is not the same as the one I attach here. Could the real Muybridge stand up please.